For centuries the city of Harar, on the eastern fringes of the Ethiopian highlands, was a sanctuary, its people protected by a great wall that surrounded the entire city. But in the late 19th century it was finally annexed by the Ethiopian empire. Harar regained a bit of independence in 1995, when the area around it became the smallest of Ethiopia’s nine ethnically based, semi-autonomous regions. Today it is relatively peaceful and prosperous—and, since last month, a sanctuary once more. In recent weeks thousands of Ethiopians have poured into areas around Harar, fleeing violence in neighbouring towns (see map). Nearly 70,000 people have sought shelter just east of the city. Several thousand more are huddling in a makeshift camp in the west. Most are Oromo, Ethiopia’s largest ethnic group. Its members clashed with ethnic Somalis in February and March, resulting in the death of hundreds. The violence erupted again in September, when more than 30 people were killed in the town of Awaday. Revenge killings, often by local militias or police, have followed, pushing the death toll still higher. In response, the government has sent in the army. Ethnic violence is common in Ethiopia, especially between Oromos and Somalis, whose vast regions share the country’s longest internal border. Since the introduction of ethnic federalism in 1995, both groups have tried to grab land and resources from each other, often with the backing of local politicians. A referendum in 2004 that was meant to define the border failed to settle the matter. A peace agreement signed by the two regional presidents in April was no more successful. When the ruling Ethiopian People’s Revolutionary Democratic Front (EPRDF) swept to power in 1991 after a bloody 15-year civil war, federalism was seen as a way to placate the ethnic liberation movements that helped it to power. The previous regime had been dominated by the Amhara, the second-largest ethnic group (the Eritreans broke away to form a new state). Eventually ethnic loyalties would wither as people grew richer, went the thinking of the Marxist-inspired EPRDF. But the way federalism was implemented caused problems from the start. New identity cards forced people to choose an ethnicity, though many Ethiopians are of mixed heritage. Territories often made little sense. 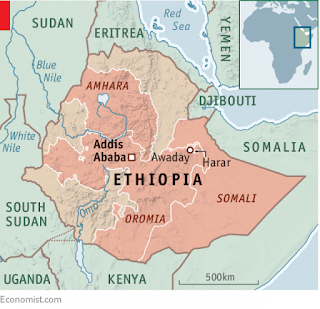 In the Harari region, a minority of Hararis rule over much bigger populations of Oromos and Amharas, a source of resentment. Boundaries that were once porous became fixed, leading to disputes. For years the EPRDF sought to dampen the tension by tightly controlling regional politics. But its grip has loosened over time. Local governments have grown stronger. Regional politicians are increasingly pushing ethnic agendas. The leaders of Oromia, the largest region, have drafted a bill demanding changes to the name, administration and official language of Addis Ababa, the capital, which has a special status but sits within Oromia. They have stoked ethnic nationalism and accused other groups of conspiring to oppress the Oromo. Politicians in the Somali region are no more constructive. They have turned a blind eye to abuses by local militias and a controversial paramilitary group known as the Liyu. The region’s president “has a fairly consistent expansionist agenda”, says a Western diplomat. 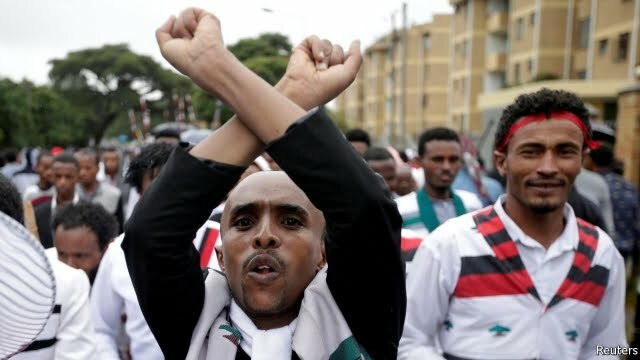 “He may have spied an opportunity.” The federal government, now dominated by the Tigrayan ethnic group, was rocked by a wave of protests last year by the Oromo and other frustrated groups.